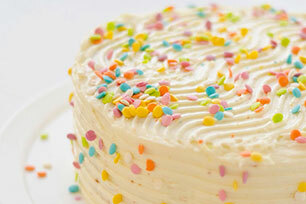 Baking a birthday cake is simple with this Easy Vanilla Birthday Cake Recipe. Frost yellow cake with a delicious blend of pudding mix and whipped topping. Prepare cake batter and bake as directed on package for 2 (9-inch) round layers. Cool in pans 10 min. Remove to wire racks; cool completely. Beat pudding mix and milk in large bowl with whisk 2 min. Stir in COOL WHIP. Stack cake layers on plate, filling with 1 cup pudding mixture. Frost top and sides with remaining pudding mixture. Top with sprinkles. Prepare using a chocolate cake mix.